2-In-1 hard/soft construction – hard exterior, soft, protective rubberized interior. Speck’s CandyShell Grip case turns all thumbs into thumbs up! An updated design incorporates interlaced plastic and rubber grip details to provide more solid structure and modern-digital style. Textured rubber grips on the back add extra grip and comfort. And thumb bumps assist alignment with virtual touchscreen buttons. And of course, since it is a CandyShell case, you get CandyShell’s patented unibody hard/soft design that combines the flexibility of a skin with the durability of a hard shell. I have owned every iphone since the 3G, and have used dozens of cases. I’ve always been using “safer” cases, since I’m a klutz, and I regularly drop my phone. First, functionality. The case is a perfect blend of a soft inner shell, and hard plastic molded on top of that. This is a great combo, which really offers protection from everything except water. My wife had used a Speck CandyShell on her iPhone4, while I used an Otterbox Defender on my iPhone4S (I was really scared of the glass back). Well, 1.5 years and many drops later, both phones survived in the same condition. I was nicely surprised, since my wife had quite a few nasty drops. Also worth noting is that on Otterbox cases, the soft and hard shells are not molded together. Not only is that bulkier, the soft shell stretches over time and doesn’t fit well. I also prefer a hard outer shell, because soft ones are hard to put in your pocket. The grips on this Candyshell case did not make it harder to put in my pocket than your average hard case. Just what I wanted. Second, the rubber “grips” are superb. The previous Speck Candyshell Grips (for iphone 4/4S) had a horrible grip pad that was glued on, and was deep enough to get much lint stuck in there all the time. Lotsa bad reviews on Amazon. On this updated model, the grips are actually not glued on, just as I had hoped. A close inspection appears to show they are part of the INNER rubber shell. Meaning, they stick out THROUGH the hard outer shell. A+ design. They are also shallow enough to provide excellent grip and not attract too much lint. Also, the rubber grips keep the case elevated, so far PREVENTING SCRATCHES to the external hard plastic shell, a common complaint about the regular Candyshell (NON-Grip)Case. Third, size. This case leaves the iPhone 5 nice and slim, and still fairly light. It appears that Speck used better materials for these new Candyshell versions, and because of this was actually able to slim down the case itself as well. Even the lip protruding from the front edge of the device has been lowered, while not effecting its ability to keep the phone above a table surface when face-down. Fourth, finish quality. I have to praise Speck’s design team for the attention to details. -The new case materials look and feel great. The new inner-shell “rubber” is harder, and look like will surely last a while. -The lip protruding from the front edge of the device has not only been lowered in comparison to the old Candyshell. -Its now also about 1mm lower directly near the sides of the screen. Yes, 1mm lower lips on the sides of the iPhone, than the top and bottom lips. The result is much more comfortable to use the iPhone in landscape mode. It barely raises your thumbs above the screen, while providing a perfect height to rest your fingers. -The cut outs look just right. The speaker/mic grill does not look like a perfect fit, but it also doesn’t sit flat on the iPhone5’s grill. Testing revealed no sound problems with the mic or speaker. Fifth, a bonus feature is surprisingly BETTER sound from the iPhone5’s speaker. I am a bit of an audio enthusiast, and have even made some music with Cubase/Ableton. Without a doubt, the case improves the mid-range (and a bit of bass), and balances it with the high treble on the iPhone5’s naked speaker. I believe that this is due to the extra space between the phone’s speaker grill and the case’s grill, which gives room for the sound to amplify and breathe better. Hard to tell if this was designed for this intentionally, but a closer look shows that this “space” was intentionally cut into the inside of the case. Please note, large headphone plugs will NOT fit with this case on. I have had no problems with what I tried: the apple earpods, JVC Marshmallows, and even a pair of cheap headphones with the old “L” shaped plug. A stero extension cable I have, with plugs about as big as Radio Shacks’, did not fit. Honestly, the iPhone5 is so thin, I am not sure how this can be solved with any case. Whether or not this is a problem, is for you to decide. I am happy I pre-ordered 2 of these (for me and my wife), and I would recommend it to anyone needing a good iPhone case, if not a bit tough too. I feel very safe with this case on because of its protection and excellent grip. Speck designed a winner, with great attention to detail. For a device I use so much every day, this is very important. 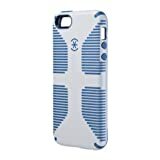 I bought this case from Speck (white/black) and it pretty much addresses every design flaw that has been associated with the Candyshells for other iPhones. The grips seem to be well made this time, not lint traps. The case fits perfectly and has a nice slim profile. The rubber covering the buttons give good tactile feedback and the buttons are easy to push. One big upgrade is at the bottom of the case where the lightning connector is located. The small strip of case rubber/plastic that bridges around the connector port is much smaller than before which means a much less chance of breaking off like on practically all other Candyshells of the past. Great case and the white/black looks slick on a black iPhone5. I just purchased this for my new white iphone 5. I got the white and harbor blue. The blue is a little more of a steel blue vs. a brighter blue (for women who care about color)…it’s more muted than I thought. I like the grips and feel of the case. It covers all the corners and looks nice on the white phone. It’s practical and works perfect for my phone. I purchased this along with the Tech Armor Screen Protectors.